Jacqueline Thomas, an award-winning writer and editor, was once Washington bureau chief for The Detroit News. She’s appalled by the rhetoric against journalists coming from The White House these days and wants journalists to push back. “When I was a Washington bureau chief, I never had to deal with this many attacks from the White House,” Thomas said. She’s covered more than just D.C. Until mid-2009, Thomas was a senior editor at The Indianapolis Star. 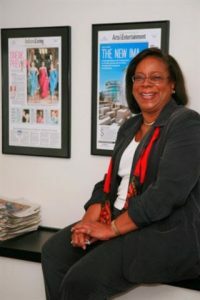 During her 30-plus year career in the newspaper industry, she also worked as a reporter and editor for The Baltimore Sun, the Detroit Free Press, the Courier-Journal, the Louisville Times and the Chicago Sun-Times. University of Kansas and the University of Alaska Fairbanks. 1. Looking back over your career, what are you most proud of? I covered public housing in Chicago many years ago and it included a period when the mayor of Chicago moved into public housing to call the federal government’s attention to how bad conditions were and how bad the city needed help. Of the things I wrote, that’s probably the thing I’m proudest of. I was Washington bureau chief for The Detroit News. We looked into personnel issues in the office of one member of the Michigan congressional delegation. Some appalling things were going on. Ultimately, she lost her re-election campaign. I think, more than any other reason, it was because of the disclosure of how she treated employees. I think it’s a very, very tough business to make your way in, especially as an African-American woman. I wish I had been tougher earlier. There were things that happened to me in the workplace that I wasn’t prepared for. I was part of what was a second wave of black journalists coming into newsrooms. There weren’t a whole lot of people ahead of us. The ones who were there were helpful, but I didn’t really know them. I wish I had sought out more people earlier. I always believed, and I still do believe, there are two aspects to this job. There are the tools that can be learned. There’s a tendency to overlook some of the basics. Your basic economics. Your basic political science. There’s too much emphasis on training as opposed to education. I say that having taught journalism. I wish students would find time to do more. I learned most of what I know about the skills on the job. 3. What did you think about the coverage of the midterm elections? It was very easy the night of the election to come to the wrong conclusion. I think some people did. I remember Gore vs. Bush, for example. We were ready to go with Gore as the winner but pulled back in time for the print deadline. We really can’t anticipate the news. We can prepare people in our reporting for things to change or for things to be uncertain, but you really can’t predict. Journalists, in general, did a better job this time around because they learned from the Trump victory that it’s really dangerous to make predictions. 4. What are your thoughts on the #FreePress editorial initiative started by The Boston Globe? As a former editorial page editor, I certainly would’ve signed up for that. Is it going to change the way the way the president thinks and acts? No. Did it maybe get a couple of people to say ‘All those people all over the country think there’s a problem here. Maybe I should think about it again.’? That’s important. Given some of the things [President Trump] has said, we, as in we the press, would have to be totally masochistic to not to speak out in opposition. We have a responsibility to this country and to the people of this country. To have a president who questions our loyalty or patriotism is appalling. Casting a broader net and recognizing that there are these people —who live probably not on either coast — who may be very unlike the people that national journalists know. When I went on an out-of-town assignment, I always, when possible, made an effort to talk to local reporters to get the lay of the land. They do know things that you don’t know when you literally parachute there. There were journalists in many of these places who recognized an anti-Hillary Clinton sentiment that didn’t get through to a lot of national reporters. It’s why local journalism is so terribly, terribly important. 6. How different are local elections covered vs. national elections? That’s changed over the years. When I was a young reporter covering local elections, we covered many of the local elections. We called it body coverage. If a person was out campaigning, a reporter was with them. The Chicago papers were particularly strong on that. I’m not sure the resources exist in a lot of communities to cover campaigns like that. That’s a sad reality of economics of newspapers these days. Being out of daily journalism, I have to admit I’m frustrated sometimes looking at local journalism. I want to know what the candidates did that day. You can’t find that out the way you used to be able to. Reporters have to use time in a smart way. I wish I had some easy answer, but I don’t. 7. With newsrooms being understaffed, how should reporters set priorities? You prioritize based on impact. In my last full-time job, I was an editor of a features department. One of the battles I was fighting when I left was the role of critics. I’d have a hard time making the argument between a City Hall reporter and a dance critic. 8. What industry trends do you like? There’s part of the emphasis on online that I really appreciate. As someone who spent her first 10 years in a highly competitive newspaper situation, I think newspapers have lost some of their sense of immediacy. Online has forced them to think about “how quickly can we get this up” just like we used to think about “how quickly can we get this in print.” For a while, I think newspapers acted like they didn’t have competition. Now it’s particularly glaring to them that they do. I love the emphasis some papers are putting on investigation. Part of your goal is to make a difference in your community and that’s the way you do it. 9. Newsrooms are also less diverse. Does it matter? I started in the mid-1970s and the numbers are as atrocious as they were in the late ’70s. I think the age of Trump has represented a step backwards for African-Americans, in general. The number of people in decision-making positions is not good. I think there’s still reason to complain that the stories too often reflect negatively on communities of color. You need to have some people who have diverse backgrounds to point out maybe a different approach or problems with a story. I’m a little disheartened about what isn’t happening now. Things were improving for a while, but I think we’ve taken some steps backwards. 10. What is your response to those who believe journalism is losing its relevance? It’s more important than it’s ever been in my lifetime. I think some very important things are happening in this country with long-term implications. To inform the citizenry is more important now than ever. The news is dying? No, the news is not dying. I think the problem is, people are getting their news from more and more places. We’ve got to do our best to ensure that they’re getting it from credible places. At any moment I can open a social media app and see stories about all kind of things. I don’t automatically assume they’re true though. News literacy efforts are really important. I wish every kid, early in high school, had to take a news literacy course. We try to teach them what sources are acceptable for term papers, but even earlier I think they need to know how to check out those things that just don’t sound right.